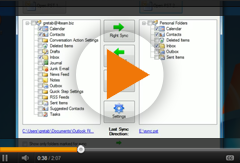 Sync2PST News - Sync2PST version 1.10 was recently released on our website. Sync2PST version 1.10 was recently released on our website. Read/Unread Status Synchronization. Now when read/unread status of item is changed, this change is also synchronized. Custom items and forms are now synchronized. Now you can synchronize not only default Outlook items, but any custom forms and custom data in items. Found updates and deletions would not be applied during synchronization in some cases, and would be detected during each synchronization again. Main application form would appear on screen during Windows start. Now "silent" start is implemented, only icon in tray appears. Not all folders would be shown in the folder list if there are some corrupted folders that cant be read from PST. Now when one of the PST files cant be accessed during start and/or synchronization, it will be opened during next synchronization attempt. "Apply" button would not become enabled when some automatic synchronization scheduling settings are changed.